Jul. 25, 2017 12:00 a.m. This year’s winner of the 19th annual Westerner Days Red Deer Motors North American Pony Chuckwagon Championships was Lee Adamson. He was also the winner of the $2,500 Dash for Cash. The final races took place Sunday afternoon at Westerner Park. “I’ve had good running times all week, but my barrels weren’t spectacular. I had to have a really good day and I think we did,” said Adamson, of Camrose, after a close race with fellow past champion chuckwagon racer Louis Johner of Mayerthorpe. Johner came second overall after the five nights, while John Stott came third and Garry Thiel came fourth, making up the top four wagons overall of the five nights. Johner ran fast all week and Adamson said he got his goal of beating him. “He’s been around for so long and he’s been consistent as heck, and I really wasn’t concerned about winning the dash. If I could beat Louis that was kind of my goal,” he said. The five-day chuckwagon event saw 48 wagons compete this year, with big crowds spectating throughout the week. With consistent runs this past week, Adamson, who was sponsored by A-1 Rentals, said his horses got lots of run and bailed him out of lots of situations. 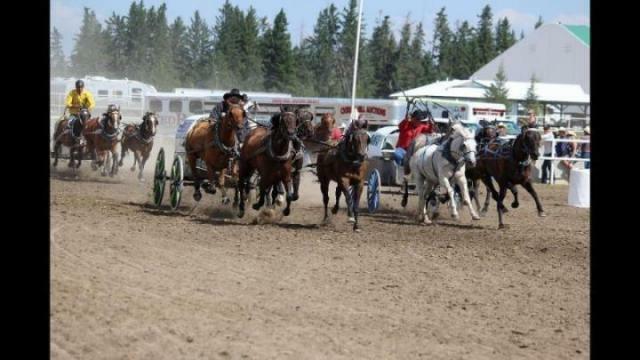 Adamson has been doing chuckwagon races for 34 years now, and this year marks his fourth title. He said he’s now officially tied with his father, which he said feels pretty good. And the chuckwagons continue to be a family affair, as his son races too, having taken over his grandfather’s hitch. It’s something the family does consistently together. Their next show is in Bruce, Alberta, and Adamson said what keeps him coming back is his passion for horses. For Johner, who was sponsored by Wei’s Western Wear Ltd., he came second place overall in the chuckwagon races. He said he felt his run was good. “I think the horses were just a little tired today, but I was really impressed to have three firsts out of five days and I was really happy with them. I was quite proud of the horses,” he said. Johner, who is 80-years-old, has been doing the sport for 48 years, and hopes to make it to that 50 year mark. “I’ve got an extremely good barn boy this year. He’s extremely good and I think he will have a job another year,” he said. And it’s not Johner’s first ride at Westerner Days. He’s won the championship twice.